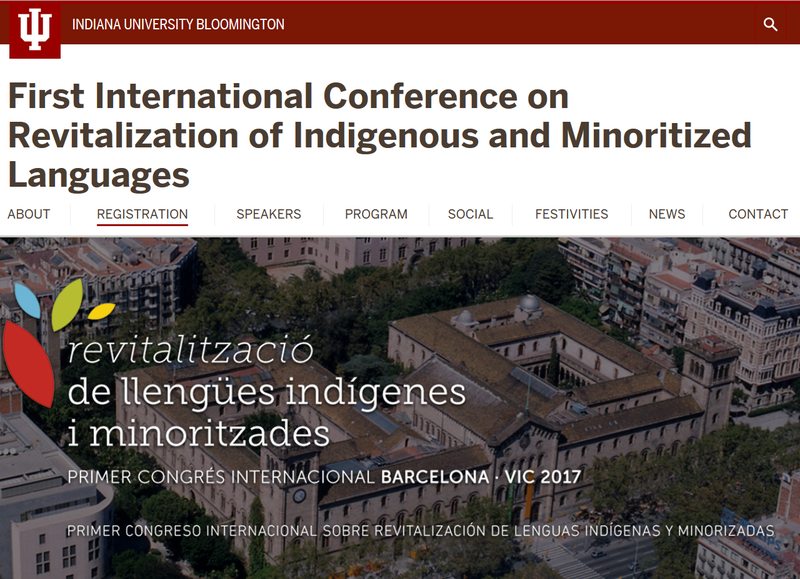 From 19 to 21 April, the University of Barcelona and the University of Vic will host the 1st International Conference on Revitalization of Indigenous and Minoritized languages whose objective is to approach from the perspective of research, pedagogy and practice the situation of the languages and cultures of the world’s indigenous and minority populations. The congress intends that the participants establish a global dialogue and, at the same time, serve as a forum to exchange ideas and experiences in language revitalization from an interdisciplinary perspective. Linguapax proposes two complementary round tables in the thematic line 1 of the Congress: The value of linguistic diversity, from an operational perspective. These activities will set out different types of alliances that generate contexts for the preservation and continuation of linguistic diversity (RT1), and will show how a plural vision of linguistic diversity emerges from the experience of the Linguapax international network (RT 2). ROUND TABLE LINGUAPAX-I. Generation of contexts for linguistic diversity: networks of linguistic, cultural and digital cooperation. 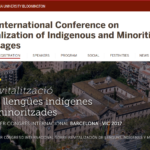 “Linguistic cooperation”: international networks of projects / exchange of experiences in linguistic revitalization. Andoni Barreña (Garabide Elkartea, Basque Country). Digital linguistic diversity, with Claudia Soria. Consiglio Nazionale delle Ricerche. Pisa. Cultural cooperation. It is a consolidated domain, with well-established tools, that rarely gets in contact with the field of linguistic revitalization. On this occasion of dialogue, the roundtable will bring together lexicon and networks / platforms which are potentially useful for linguists / activists. With Jordi Baltà, expert in international cultural relations. On the one hand, the round table intends to optimize the relationship potential of the congress by opening up a dialogue between two perspectives that intend to participate individually (1 and 2). On the other hand, it will introduce a perspective that is usually not part of the environment of linguistic revitalization, the field of international cultural cooperation – which usually acts according to the logic and circuits in which linguistic diversity rarely comes into play organically. Coordinator- Alicia Fuentes-Calle, Linguapax (Barcelona). University of Barcelona. Round table LINGUAPAX II . Plural ways to approach plurality. Linguapax was created by UNESCO in 1987. It is currently a non-governmental organization based in Barcelona since 2001. It coordinates an international network of awareness-raising and linguistic revitalization projects in different areas of the world. The field perspective presented by several members of the Linguapax network will offer a plural view on the ways to approach linguistic diversity – according to local linguistic ideologies and different revitalization strategies. This panoramic sample will want to be illustrative of the “plural forms of conceiving plurality,” in terms of one of the historical members of Linguapax, Lachman Khubchandani. José Antonio Flores Farfán, CIESAS, Mexico D.F. Mercè Solé, UOC (Arts and Humanities) / Linguapax-Barcelona. Josep Cru, University of Newcastle. Sonja Novak-Lukanovic, Institute of Ethnic Studies, Ljubljana.